Ranging from silly in nature to serious, hundreds of questions descended upon archival professionals during #AskAnArchivist Day on 4 October 2017. By participating through Twitter, our responses went beyond campus boundaries to engage with fellow archivists and the broader community. These five tweets were our favourites that helped reach an audience fourteen times the size of our followers with a total of nearly 7,000 impressions! 1. If you could express your work as an archivist in a GIF, what would the GIF be? Most people think archivists are always alone with the archives, but the reality is that I’ve spent the majority of my time juggling reference requests with arrangement and description. Learn more about what we do in the “Archives Awareness Week: a week in the life of the archives” post. 2. In 5 words… What is an archivist? Not sure if we cheated with this answer, but I think we should get bonus points as a picture is worth a thousand words! As pointed in this post, the four core functions at CTASC are: acquire, preserve, engage, and share. 3. When do you need to wear white gloves? We like to refer to this flow chart from @DerangeDescribe. https://t.co/cCI52JzBzq #AskAnArchivist. Another popular question during our class presentations, we try to educate students that the “white gloves policy” varies per institution. Generally, at CTASC, researchers wear gloves while handing photographic material (if an archivist happens to forget, this handy flowchart is posted in our back room). 4. What’s your favourite blog post? This blog post, which answers another class favourite question, helps users understand why everything isn’t available online. Unfortunately scanning everything isn’t an option as digitization is a very resource intensive activity. Learn why in the blog post. 5. We’ve seen cat records in archives, how about knitting? Because silly questions are fun and I had never thought to explore our holdings for new knitting patterns. Have you been to our reading room? As it’s a bit chilly inside, perhaps if a researcher knitted us a new pair of half mitts, warmer hands might expedite the typing up of file lists! 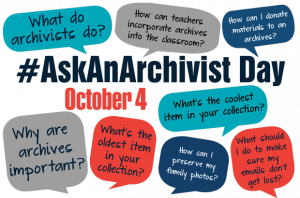 #AskAnArchivist Day is an outreach initiative run by the Society of American Archivists (SAA). It’s an opportunity to break down barriers that make archivists seem inaccessible, talk directly to the public, join with archivists around the world to impact the public’s understandings of archives, interact with users about the value of archives, and hear directly from the public about what they’re most interested in learn about from archives. Learn more about the initiative on the SAA’s website. Summaries of #AskAnArchivist Day 2017 activities from other institutions have been made available. See the US National Archives (thematically grouped: chat with the Archivist of the United States, WWI, and electronic records), the Presidential Libraries, Rutgers University (and their blog post), University of Denver Libraries, the Cambridge Historical Commission, and the Corning Museum. This entry was posted in News and tagged archival operations, archives awareness, FAQ. Bookmark the permalink.